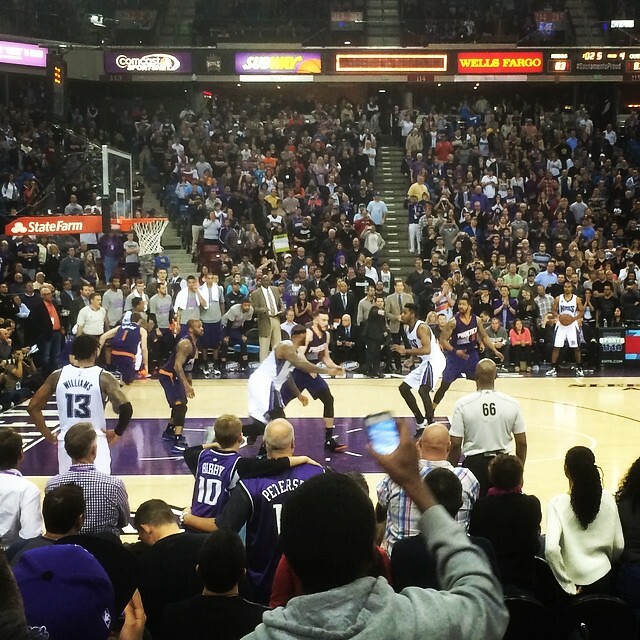 Sharon, Jack, Bridget and I went to the Sacramento Kings versus Phoenix Suns NBA basketball game. We sat in Section 104, Row b, Seats 1 2, 3 and 4. With the Kings holding a 10 point lead through most of the game, the Suns tied the score at 83 to 83 in the last minute. DeMarcus Cousins hit a jumper as time expired to win the game by the score of 85 to 83. With Rudy Gay and Darren Collison out with injuries, Cousins was the leading scorer for the Kings with 28 points and 12 rebounds. He was 13 for 25 from the field and 2 for 4 from the free throw line. With Eric Bledsoe home with his pregnant wife, Isiah Thomas was the leading scorer for the Suns with 26 points. He was 8 for 17 from the field, 3 for 9 from three point range and 7 for 9 from the free throw line. The Suns struggled with their shot all night. They were 5 for 28 (18%) from three point range. Markieff Morris went 3 for 20 from the field. Jack is a Suns fan. We saw both of the Suns versus Kings games last season [4/17/2014, 11/19/2013] and the game earlier this season [12/26/2014]. He was not pleased as Cousins shot bounced in. Kurt and Craig were in section 202. Sharon and I visited with Kurt at halftime. The Kings have 1 win and 3 losses in games that I have seen in the 2014-2015 NBA season.